Superponics is the best hydroponic system for all sizes and scale of grow operations. 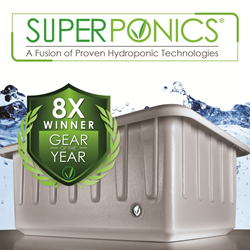 Supercloset's Superponics systems have won the coveted 2017 STASH Gear of the Year award for Best Hydroponic System 2017. STASH (Significant Technological Achievements in Secretive Horticulture) Awards are presented by High Times, a magazine who has been revered since 1974 as a leading authority. The awards celebrate advances made by the cultivation community, and, unsurprisingly, Superponics has been chosen as the best hydroponic system. Superponics, the fusion of proven hydroponic technologies, has a system for everyone. Starting with the small home grower looking to grow in his closet, all the way to the next innovative commercial grower, Superponics is the best hydroponic system for all sizes and scale of grow operations. SuperPonics are BPA free, food grade quality hydro systems and can accommodate any plant variety of choice. With these easy-to-use systems, fill and draining is quick and simple. With Superponics, growers receive lifetime grow support, as well as a 3 year warranty on craftsmanship of product. Given the number of solutions for growers, its simplicity, a 3-year warranty of the product (that’s 12 grows! ), and the company standing ready to help growers, it’s no wonder that Supercloset’s Superponics is the best hydroponic system. With an A+ rating from the Better Business Bureau, 15 years as the leading manufacturer of Automated Hydroponic Grow Systems and Grow Boxes in the world, a 3 year No-Hassle Warranty, and Lifetime Customer, Technical, and Grow Support, SuperCloset delivers the confidence that growers need to choose the best hydroponic grow system for their needs. To learn more about Supercloset, click here.